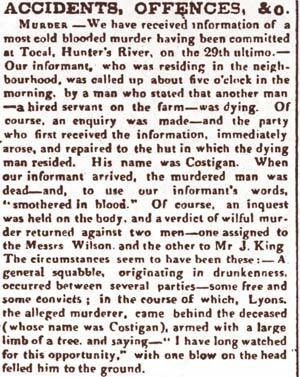 "Oh my God, Barney has killed Costigan"
The most serious colonial offence by a Tocal convict occurred when Bernard Lyons killed Patrick Costigan in April 1837. Costigan arrived in NSW in 1827 with a seven year sentence for highway robbery, which he served at Tocal and continued to work there when free. Lyons was also Irish, and was assigned to Tocal on arrival in NSW in 1832 with a seven year sentence for perjury. By 1837 the two had lived and worked together at Tocal for five years. On 29 April 1837 all the men worked hard thrashing wheat and barley, and finished late. After their 'evening rations' one of them bought two gallons of wine from a nearby farm and they began to drink. Several scuffles broke out, during which Lyons hit Costigan on the head from behind with a lump of wood while Costigan was fighting another man. Above right: report of the incident in the Sydney Herald 11 May 1837. "About 20 minutes before five in the morning, I was called up by Clements & Partridge Stating that Costigan was Dying. I Immediately Drest myself and went to the Hut. where you may judge the Sensations of my mind, to behold a man Dead, Smothered in blood, having been murdered, and who had just expired before I came. Where he was dying near the door of his hut is covered with blood. He bled at least a bucketful it was a most dreadful sight to see. I have seen many men lying dead on the Deck of a Ship after Action, but the sight is not so piercing to the feelings as a Cool premeditated murder...They were both Irishmen and Intimately acquainted. Ever since the fatal deed has been committed, my Inside trembles the dreadful sight is Continually before me, so unexpectedly, it was in the dark when I went to the Hut and the boy Clements brought a light..."
Bernard Lyons was convicted of manslaughter and served three years in irons.